Discussion in 'Forum and Server Announcements' started by BiGUNMAN, May 10, 2016. Hi guys, this is BiGUNMAN again! 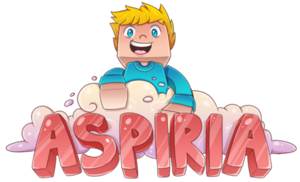 I'd like to talk of some changes you'll be seeing in the near future on Aspiria and the updates were shifting out every couple weeks (in no particular order). Firstly, a new hub! We've created a beautiful new hub which you can explore, there are a couple hidden secrets to it for you to discover (a lot actually), and it looks great! I'd like to thank those that helped make it so awesome: @AdaptedDolphin, Zozmonster, _Golden_Star_ and @Isaiahls. /menu - Manage your shopping, trading, warping and more soon. /shop - Has been revised to add trading and a "Player Market". A player market will at some point be available where you can sell items to all players via a menu. Anyone from anywhere will be able to buy your items. Respawning has been redone, when you die you'll respawn in a radius around your death location and be notified of this (not at the pvp warp/arena). Although it's not new, I would also like to encourage using /trade - For selling or buying items for players! It's a safe way to guarantee you get your goods. Some other major changes will be coming soon, but I don't want to mention them until they happen, and when they do I'll address them in a separate announcement. Finally, I'd like to address the EULA and what it poses for us. The EULA is a Mojang requirement that we must follow. It requires us to remove certain benefits from the ranks we offer on the server, which is very unfortunate, but is alright since we plan to adapt to that. All donors before the EULA enforcement will be given their appropriate benefits, but all new donors will be receiving new benefits which are still extremely good, and may be considered equivalent to the old benefits. In short, this means the ranks will be changing, we will be decreasing the number of ranks we offer (this is because we want to make the selection simpler), and we'll be adding new benefits, and new things you can purchase on the store. Simply removing benefits that violent EULA will not allow us to sustain ourselves or grow (when it comes to purchases), so we will be revising the store, the server, and the ranks in order to create a new and hopefully as good if not better EULA compatible environment. I will be announcing the changes in the next news post. No, it was removed because they implemented it another way. I thought there was an option to donate for 15 homes... Seems like I waited too long to get it. Love the new spawn area. The old one was a dark cave and hard to see anything in it. You have a great server, and I have very much enjoyed being on it. Glad that is all fixed! Also, back to my previous post about "free" or earned ranks, what do you think BiG? I would love for your opinion! Just found out about Party Chat. Roleplayers shall rejoice in Party Chat's name. so are the auctions busted for everyone? Time to find more, and keep up the wonderful work on the server! I'd love to see the new "earned" ranks for playing-time, and the head shop [ fish and security cameras ;P ] ! Yes, but only temporarily, they will be back soon.